The map on the information kiosk at Boylston and Clarendon streets does not show that intersection. Residents had called the company with complaints about the kiosk maps. 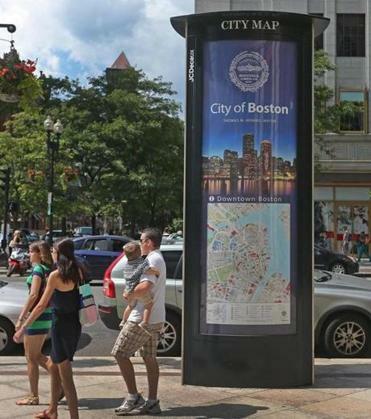 Debra e-mailed a few weeks ago with a photo of a map on an advertising kiosk in the Back Bay. At first glance, it looks like a fine map — there’s the Common, the State House, and even a little icon to guide visitors to the swan boats — except that it doesn’t show, well, the Back Bay. And it’s not the only one. A similar map at the corner of Clarendon Street and St. James Avenue shows the same not-so-helpful cartographical vista. The maps are a feature of the 17-foot advertising kiosks managed by the advertising firm JCDecaux that dot large swaths of the city. Peter O’Sullivan, director of the city’s street furniture program, said local officials were well aware that the maps weren’t exactly optimally designed. They’d received calls from residents with a different complaint — the “you are here” sticker affixed to the map was in the wrong spot. After staff went out to investigate the problem and fix the stickers, they saw that some of the maps didn’t have any stickers . . . because the kiosk’s location didn’t appear on the map. But, O’Sullivan said, the city has just concluded a months-long process to design new maps — which would have needed to be replaced soon anyway because of a two-year schedule for updating. The new maps will be different based on where they are located. They’re being printed by JCDecaux, O’Sullivan said, and some of them will appear on Boston streets as soon as the middle of this week. One month after the premiere of Boston-Hyannis service on the brand-spanking-new CapeFlyer, ridership has sputtered — but the MBTA general manager, Beverly A. Scott, is hopeful that the dropoff is a product of bad weather, and that the train’s popularity with Cape-goers will pick up in July. In a report to the MassDOT Board of Directors Wednesday, Scott said that ridership has taken a downturn since its inaugural run: 808 people rode the train on its first weekend, but only 671 on its second weekend, and 352 on its third weekend, June 7-9. June isn’t usually a great month for business on the Cape anyway, she said. She said she is confident things will pick up this last weekend of June, then get booming over the July Fourth holiday. “There is every expectation that the Cape Flyer Seasonal Service will be successful through the Labor Day weekend,” Scott said. Even with lackluster ridership in the past few weeks, the service is still making money — an average of a modest $12,300 per weekend. The train only needs about 310 passengers per weekend to allow the service to break even. Get excited: The long-awaited Longfellow Bridge reconstruction project is about to begin. In case you missed the news a few months ago, the Boston area is in for some major traffic disruptions caused by the planned renovations of the “Salt and Pepper Shaker Bridge” that connects Beacon Hill with Cambridge: three years of traffic snarls, 25 weekends of Red Line diversions, and a long-term hiatus for all northbound car traffic on the bridge. And it’s all set to start this summer. Mike Verseckes, spokesman for the Massachusetts Department of Transportation, said department staff is now in the process of modifying traffic signals on either end of the bridge to accommodate for the coming jams. After that, starting as early as July 8, vehicular traffic flowing from Boston to Cambridge will be blocked off, leaving only a single lane that will be designated for cars moving southbound. The Red Line is scheduled to be diverted around the bridge for two weekends this summer: Aug. 10 to 11 and Aug. 24 to 25. On those days, buses will shuttle passengers from Park Street and Charles/MGH stations to Kendall/MIT. Speaking of bridges, the national advocacy group Transportation for America came out with a study this week on the state of the country’s bridges — and let’s just say Massachusetts is like a C+ student at a failing school. Massachusetts ranked 28th on the list of states with the highest percentage of structurally deficient bridges: 9.6 percent of bridges in the state are in dire need of maintenance or replacement, just under the national average of 11 percent. And perhaps most shocking of all: There are more structurally deficient bridges in America’s 100 largest metropolitan areas than there are McDonald’s restaurants in the country. You can check out the full list of bridges at t4america.org/resources/bridges. And yes, Longfellow Bridge is on the list. Correction: Because of a reporting error, an earlier version of this column inaccurately described the diversions on the MBTA Red Line that will result from the Longfellow Bridge reconstruction project. On weekends when the bridge is closed to traffic, buses will shuttle passengers from Park Street and Charles/MGH stations to Kendall/MIT.